Information about our yoga teachers at Barcelona Ashtanga; the K. Pattabhi Jois Ashtanga Yoga Institute (KPJAYI) in Mysore, India; and some frequently asked questions about the practice. 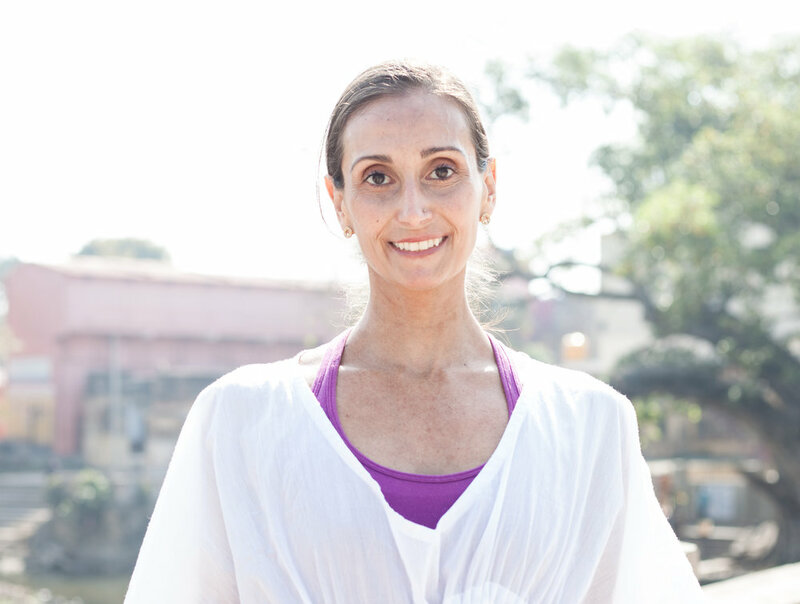 Get to know our teachers, find out about the KPJAYI in Mysore, India, and see some common questions about the studio and practicing with us. I was introduced by my family to the philosophical and meditative aspects of yoga at a young age, but it was not until February of 2003 that I took my first yoga class and was exposed to the therapeutic effects of Ashtanga Yoga. For the next few years I attended guided Ashtanga classes at my local studio, and in September 2006, I completed a 200-hour teacher training with YogaWorks and began teaching full time. I ran my own Mysore program from 2011 to 2013 in Washington, DC, before moving to Barcelona. I consider teaching Mysore a tremendous responsibility that should not be undertaken lightly, but it is also one of the most worthwhile things you can ever do as a teacher. My teaching style focuses on alignment, ease of movement, and being kind to yourself and your body. I urge my students to challenge themselves physically and mentally while also understanding that we need to laugh, and enjoy the sweet moments that open up for us in our daily practice. Since 2009 I have been fortunate to be able travel to Mysore, India, annually to study Ashtanga in its traditional setting with my teacher R. Sharath Jois, Director of the KPJAYI and grandson of the late master of Ashtanga yoga, Sri K. Pattabhi Jois. I am deeply honored to be one of a select number of students to have Level 2 Authorization and to be given the blessing to teach the full Intermediate Series by the KPJAYI in Mysore. I also had the privilege to have been asked by Sharath to assist in the Shala (school) for the entire month of March in 2012 and attend the first Special Teacher's Course offered by Sharath in Mysore in the summer of 2014. If you would like more information about me, or to read some of my articles, please visit my website at: antonellaaccinelli.com. My introduction to Ashtanga Yoga was in the spring of 2005 during a two-hour beginner’s course. This was my first real experience with yoga, beyond the few classes my mother took me to when I was in elementary school. The intro course energized me in a different way than other activities I had done in the past. I soon found myself taking more and more guided classes before ending up at a traditional Mysore program in 2006. Besides offering both a physical and mental balance to the rest of my day sitting in front of a computer, I was attracted by the focus on the breath in the practice as well as the daily challenges on the mat. I was fortunate to be provided with a solid foundation in Ashtanga by a great set of Washington, DC teachers including David Ingalls, Keith Moore, and Faith Scimecca. This foundation led me to first visit Mysore for a month in 2008 to study with R. Sharath Jois at KPJAYI, in what I thought would be a one-time experience. Mysore, however, got under my skin, and I continued my studies both with Sharath, and his mother Saraswathi, over several more visits. In 2012 I began training as an assistant with Antonella Accinelli, and in 2017 I was honored to receive Level 1 Authorization from Sharath. Beyond transmitting to students the lessons I have a learnt over the last twelve years, I aim to show that a regular practice can be incorporated into daily life, and that a little laughter can go along with a lot of sweat. The Sri K. Pattabhi Jois Institute (KPJAYI) is the home of Ashtanga Yoga. Originally called the Ashtanga Yoga Research Institute (AYRI), it was started by Pattabhi Jois (Guruji) in 1948 in the neighborhood of Lakshmipuram, in the city of Mysore, state of Karnataka, India. Upon Guruji’s death in 2009, the Institute was renamed to honor his memory. Originally holding only 12 students the institute grew over time until it could no longer accommodate the number of people coming to visit. In 2002 the Institute was moved to a larger space in the neighborhood of Gokulam, Mysore, where it is still located today. The Director of the KPJAYI, R. Sharath Jois, is Grandson of Pattabhi Jois. Sharath practiced with, and assisted, his grandfather for over 20 years, learning at the feet of this yoga master on a daily basis. Both Sharath and his mother, Saraswathi, continue Guruji’s legacy by teaching at the KPJAYI. For more information about the Institute and practicing there, please go to www.kpjayi.org. Should I have prior yoga experience? Prior yoga experience is not necessary. Mysore is a great system for beginners because you move at your own pace. The teacher is there to guide you and you are taught based on your needs. Is Mysore a 4 hour or 2.5 hour class, as it is listed on the schedule, and do I have to be there all that time? No. Mysore is a type of class where you are taught individually within a group setting. This means that you can come to class at any point during the scheduled time period. For example, if your practice is 1 hour long, your can come at 7 and be finished by 8, or come at 8:15 and be finished by 9:15. It is completely up to you. We only request that you come no later than one hour before the class ends. If I am new to yoga or Ashtanga how long will my first Mysore class take? At the beginning, your practice will be only 30 to 45 minutes long. Depending on your previous level of activity and how well you remember the sequence, your practice will gradually build in length over time. The only things you need to bring are yourself and a desire to learn. You will need to bring a yoga mat, if you have one, but we do have a few mats to borrow if you do not. I have taken some Ashtanga classes before, should I have the sequence memorized? It is not necessary to have the Ashtanga sequence memorized before coming to class. We will teach you one posture at a time, and by repetition you will come to remember the order of the poses. Is this yoga the same as hot yoga? No. Ashtanga is a specific system that combines breathing, moving with the breath (vinyasa), and one point of focus (drishti); these three pillars are called "tristhana". When you do these three things in unison they create heat internally to purify and detoxify your body. Unlike hot yoga, we want this heat to build from the inside out, not come from an external source. All of that being said, you will probably sweat during this practice. Can I drop in to a Mysore class? You may drop in to a Mysore class if you have an established Mysore practice or are visiting from out of town. If you are a beginner, or new to the Ashtanga style, then we require a one month commitment for your first month. Feel free to contact us if you would like to come observe a class! Do I need to sign up ahead of time before coming to class? You do not need to pre-register for class. However, you may want to give yourself a few extra minutes on your first day to familiarize yourself with the space and fill out our student registration form. If you have any physical conditions which the teacher should be made aware of, you can arrive a little early to discuss these in person or you may send an email to the studio. Please see Schedule and Prices for an answer to this question.